In order to penetrate the Undying temple and reach the tech and information hidden within, the two must decode the ancient race's secrets and survive their traps. But the more they learn about the Undying, the more their presence in the temple seems to be part of a grand design that could spell the end of the human race.. Unearthed is a Sci-fi that takes us on an adventure. I know everyone says it’s like Indiana Jones but I like to relate to Zelda a little bit. If you thirst for adventure, there is plenty of that included, plus great leading characters. Mia is quite the savvy girl. I think people underestimate her, which is her greatest strength in a way. She’s smart and clever. She knows her way around a situation. She often is saving herself and Jules. I loved her devotion to her sister as well. That she is not motivated by greed. Jules comes from a very different background than Mia. He hasn’t had to fight for everything he has like she has. I liked him because despite that, he is still kind and I think tries to understand where she is coming from. Despite how he was raised though, he’s waited under the pressure of his family's reputation. He wants to make things right and ultimately protect the Earth. I loved Mia and Jules and the relationship that slowly brews between them. It starts out that they consider each other a kind of means to an end. They both need something and working together gets them there faster. As they spend time together though they find themselves moving to friends and then something more. They build trust up gradually and managed to find ways past secrets and betrayals. I really like the bond they form and how they get to that point. The book has a great plot. The attempted exploration of other planets in order to find a new Earth or at least to save Earth. This is because Earth has burned out it’s resources which has caused environmental changes. I think I must always have Breath of the Wild on my brain lately because the Temple they go through on the planet, reminded me of the temples in Zelda games. Which of course I love, so it made it even more exciting. I love that they had to figure out puzzles in order to make it through, it added another element besides just racing against time. Mia of course is like Indiana Jones and Jules is her sidekick. They are not alone on the planet, however, and find themselves also running from villains. All these circumstances are put into motion by The Undying, an alien race, last transmission. Which leads to more questions as they search the surface as to who The Undying actually are and is following their bread crumbs good or bad. Wow that ending. Wow. So many thoughts. 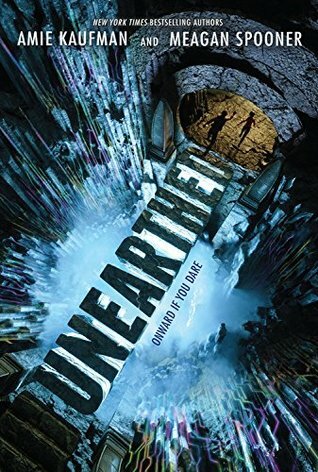 I really enjoyed Unearthed and can not wait for the next book.